Hau Giang (VNA) – The Mekong Delta province of Hau Giang on April 3 piloted its first smart rice cultivation model in Vi Thang commune, Vi Thuy district. 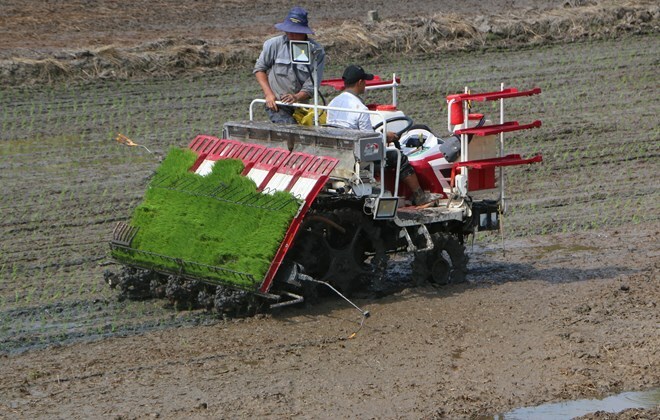 The model is jointly carried by several local units and Rynan Holdings JSC, whose smart rice cultivation technologies are being applied in several Mekong Delta provinces. Covering a total area of 12ha, the model attracts the participation of 12 local households. The model can cut water volume for production by 30 percent, labour and seedling costs by over 50 percent, and fertiliser and other greenhouse gases by over 40 percent. As a result, it can boost profits by 20 percent compared with normal cultivation. The pilot of this model is the first step Hau Giang is taking to turn its chemical agriculture into an organic agriculture.